Medical Equipment is used by medical personnel to treat illness and injury. A handheld medical tool that is used to seal and promote the healing of wounds from surgery or deep trauma. A medical device that is used to supply a body with oxygen. A medical tool that is used to transfer blood into an injured patient. A specialized medical device that is designed to restart a stopped heart. Modern units also work with artificial hearts. A new medical tool that combines the uses of two separate devices, stimulating the repair of broken bones and healing of skin wounds. One of the best known pieces of medical equipment, the Hypospray is used to inject medications directly into the body through forced skin absorption. Based on phaser technology, the laser scalpel is a medical instrument used for creating incisions in various tissues. If needed the unit can be used to create a subdermal cut without damaging the skin itself. 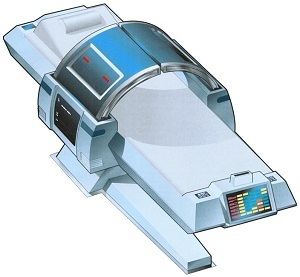 A specialized version of the standard issue Tricorder, the Medical Tricorder is equipped with sensors and analysis software tailored for medical diagnostic purposes. Similar to the Cardiostimulator, the Neurostimulator is a medical device used to induce brain activity and to repair arterial tears. A specialized sensor used to perform diagnostics on visual receptors of persons utilizing ocular implants or VISOR technology. A Physiostumulator is a medical tool that is designed to elevate metabolic functions. A medical instrument that is used to change the coagulation ratio of blood. A short term supplement to the medical team, the Emergency Medical Hologram is a specialist hologram that can assist with the treatment of patients in a crisis. An advancement over the standard replicator system in use in the Milky Way Galaxy, the Gentronic Replicator scans damaged organs and then creates a replacement. Typically found on larger vessels, medical transporters are smaller, more detailed units designed to complete noninvasive surgical procedures. The Biobed is a medical tool designed to provide the medical staff with detailed information on the current health status of a patient. Specialized devices designed to lower a patient's internal body temperature to place them into suspended animation. The Surgical Biobed is a specialized diagnostic bed incorporating advanced sensor packages and equipment installed directly into the unit.